The efficiency of the induction motor can be improved by controlling the air-gap flux. The flux level varies with load torque i.e. at light load torque the flux required is less than the flux required as the load increases. When the motor is operating at a particular operating point defined by speed and torque, an infinite pair of impressed voltage/frequency can achieve this operating point. However only one particular pair of voltage/frequency will result in the minimum losses and maximum efficiency. Hence by adjusting the voltage and frequency via a variable voltage variable frequency drive (VVVF) optimum efficiency can be achieved. Is the motor itself capable of operating at less-than-full speed and/or able to withstand the voltage waveform generated by the specific VFD chosen? If the answer to any of these is "no", then you don't have to go any further. A VFD is not the solution - at least, not by itself. You now have energy savings for a single operating point. Repeat the calculation for all expected operating points to get "total" energy savings. Now take the cost of a VFD and (if necessary) a new motor, add the cost of additional infrastructure (foundation / building to house drive, etc.). Divide the total capital expense by the "total" energy savings you get for a calendar year. If the result is below 3.0, chances are excellent that the change is not cost-effective from the user viewpoint. In some instances, the limit is more like 1.5 (e.g. 18 months to recover the complete capital investment). The biggest power saving applications is in centrifugal fans and pumps. On centrifugal type devices the name in itself tells you that it is all to do with speed. If you reduce the speed by 20% your horse power requirement is cut by 50%. If you want to realize all of the potential energy savings you leave check valves and dampers wide open and use motor speed to control flow. Some people in maintenance will tell you that there are bigger savings to be had mechanically. By reducing speed you increase the life of impellers, wear-rings, bearings and wear parts within the pump. If you have a standalone pump that requires full speed the majority of the day the VFD savings may be minimal. 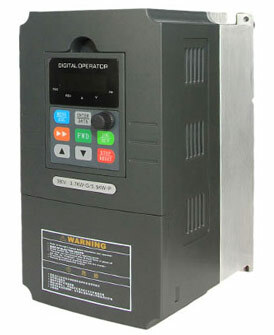 If you have multiple pumps side by side and program them to produce the flow in combination, there are major savings to be realized by installing a VFD. The savings occurs when the pump flow is normally reduced to less than 100%. Using a valve to reduce flow does not significantly reduce energy use. A VFD operating controlling to reduce flow uses energy proportional to the square of the flow (look up affinity laws on the web). A VFD at half speed uses only 25% of the energy.